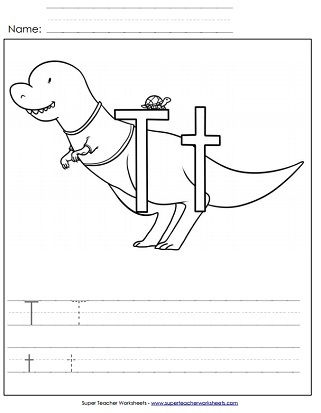 Practice writing upper and lower-case T on the lines, then color in the picture of the turtle and the T-rex wearing a t-shirt. Color the tape, tortoise, and tomato. Print some Ts. Cut it out, assemble, and wear it home. Students will learn how to write lower-case letter t on this printable worksheet. 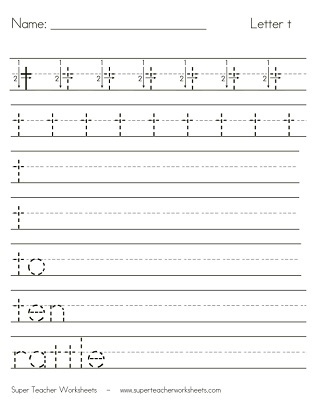 Print this worksheet to use in learning how to write lower-case t.
Use a pencil to trace along the dotted lines on this worksheet to practice writing capital letter T.
This is a great worksheet to practice writing capital letter T.
This worksheet contains a few different activities to practice learning to identify and write letter T t.
Ink dabbers are needed for this worksheet to mark the circles in the shape of letter T.